It's time for another episode of 205 Live on the WWE Network! The unthinkable has happened. Pigs are flying, hell froze over, planet Earth stopped rotating, and Enzo Amore became the NEW Cruiserweight Champion at WWE No Mercy. What will the former champ Neville do about this? For that matter, how do the OTHER cruiserweights on 205 Live feel about it? Tune in to find out and hit F5 to refresh the live recap! Last night on Raw, Enzo Amore had a celebration for his Cruiserweight Championship win. The rest of the 205 Live roster came out, including former champ Neville, and Enzo ran them all down disrespecting everybody. Neville stepped up, risked not getting his rematch for the title, and beat the holy hell outta Enzo Amore to the applause of the cruiserweight division. Let's face it, not many people in and out of WWE are pleased about the new champion, and he didn't necessarily make any more friends than he already lost. Speaking of the new champ, out comes a sore limping Enzo Amore with a crutch. Vic Joseph and Byron Saxton are the commentators for tonight. Enzo Amore: "My name is Enzo Amore, and I am a certified G and a bonified stud, and you can't teach that! Bada boom, realest guy in the room, how you doin'!?" Enzo is all jacked up from the beating he received last night as he struggles getting in the ring. "I'm sorry that took so long, but I gotta keep it real. I gotta keep it real 'cause it's the only thing I know how to do, I'm a G. Last night, I was really really hurt. Yeah I was, and I know I'm out here smiling 'cause I hide it so well, almost as well as Cedric Alexander hides his charisma. I hide it well. Maybe you didn't realize it, but Enzo Amore hasn't called out sick a day in his entire career. Week in, week out, night in, night out, beating after beating. I take that stage and I'm the same guy backstage as I am on that stage. You know what that guy is? That guy is a star, that guy is a champion, that guy is the guy that put 205 Live on the map - how you doin'? You know I'm right. I'm the reason why people are staying up late on Tuesday nights. I'm the reason why this title right here means something, because it's around the waist of Enzo Amore! So as far as that former champion Neville is concerned, the guy I dethroned, I feel bad honestly. No no listen, I feel bad, I do. I feel bad for him. Do you people honestly realize that every single day Neville has to wake up and look in the mirror? That was the punchline, he's ugly. And me, you see this thing right here? Nev, you might be partially responsible for the way I look right now, but there's more to that story. In case you didn't know why I look like this right now, I'm gonna show you what happened AFTER Raw went off air." We get a clip of Braun Strowman storming to the ring and he gave Enzo a running powerslam, then allowed the rest of the cruiserweight division to have their way with Enzo hitting every finisher on the champ. After the clip, the live crowd chants YOU DESERVE IT at Enzo, who seems a bit surprised. "I know, you're right, I DO deserve this thing right here! It's a beautiful thing people, you're right. See last night was supposed to be a great night for 'Zo. It was supposed to be such a great night that I even flew my mother out to sit in the front row and watch the show. And then, my mother sat in the front row and cried her beautiful blue eyes out because she had to sit there and watch a Monster and an entire cruiserweight division black-and-blue and son's beautiful blue eyes while I'm sitting there crawling around trying to keep my intestines intact. My mother is closing her eyes at this point, and her ears are wide open. All I can hear is the same thing she's hearing - 'one more time, one more time.' Those echoes, the same bunch of haters that were echoing that last night in my mother's ear are the same haters that probably thought Neville was a prince in shining armor coming to save the cruiserweight division. But no no no. Neville ain't Jamie Lannister, but make no mistake about it winter is coming, because I am gonna be able to put this title on ice. Last night when I entered the ring for my Certified G Cruiserweight Championship Celebration that my mother was supposed to be thoroughly enjoying instead of crying her eyes out, I had a clause in my hand. That clause said if anyone of the cruiserweights lays a hand on me they forfeit any title opportunity that they have while I am champion. Seeing as each and every one of those cruiserweights laid a hand on me, it's looking like I'm gonna retire as champion. How you doin'? And Neville, you're the one that broke that clause first. So let me address you by saying your precious right here, you ugly Gollum vs. Frodo combination, you Keebler Elf looking schmuk, you're little precious, you're never gonna lay your hands on it again. Because like that cookie dough you're playing with you Keebler Elf, there's only ONE WORD to describe you and I am gonna spell it out for you! S-A-W-F-T, SAWFT!" 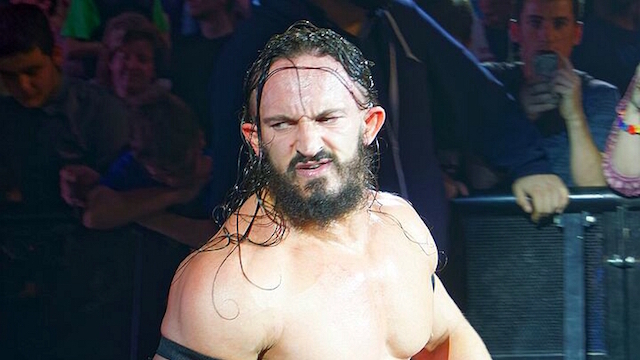 Speaking of the former champ, Neville will go one-on-one with Ariya Daivari tonight. Drew Gulak is walking backstage with a picket sign that reads "NO CHANTS" and he gives a stagehand a button. After a commercial for Raw next week and Total Bellas tomorrow night, Drew Gulak comes out to the ring with his picket sign and a bullhorn and he will sit on commentary for this match. They lock up, Nese pushes him off, the stops to do his "Premiere Athlete" pose. Tozawa begins his chant, Nese hits a running back elbow, points to Gulak for appreciation, stomps on Tozawa, taunts, and hits a Southpaw forearm. Tozawa rolls through a sunset flip, kick to the chest, jumping senton splash, gets on the top rope, Nese trips him up, does a running kick to the gut, catches him into a fireman's carry, gutbuster, 2-count, legdrop, and goes on the attack. Tozawa puts his foot on the ropes for a break, Nese hangs him up in the tree of woe, knee strikes to the midsection, drops down and does bicycle kicks to the chest, running to the head and gets a 2-count. Nese puts him in the body scissors, Tozawa hits elbows to fight out, Nese kicks him in the shoulder, kneedrop to the midsection, standing delayed vertical and suplexes him on the ropes. Tozawa nods to the ref that he can continue the match, Nese continues the pressure and gets a near-fall, and Gulak continues to spout his campaign. Nese puts him in the torture rack, Tozawa does his chant, punches him, knife edge chops, Nese kicks him, Tozawa catches him with a hurricanrana, delivers a back suplex, gets a 2-count, climbs to the top rope, Nese rolls out the ring, so Tozawa hits the suicide diving headbutt! Gulak complains that that move was high risk, Tozawa throws Nese back into the ring, gets a near-fall, starts his chanting, hits forearms, Nese hits a Southpaw forearm, Tozawa boots him in the face, Nese drops back, kips back up, does a kicking combo, Tozawa with a back kick, misses a spinning roundhouse, slides under him, Nese lands on his feet from a back suplex, pins him for 2, then Tozawa connects with the spinning kick which drops him long enough to go top rope and lands the diving senton for 3! WINNER: AKIRA TOZAWA. Tozawa eggs Gulak on with his chant, but Gulak responds by blaring the bullhorn siren. Gulak says, "I'm sorry, I'm sorry," then does it again so the fans do Tozawa's chant. Gulak: "I'm sorry, I'm sorry. You know what? I am not sorry! Tozawa, you are in direct violation of Propoal #3 to Drew Gulak's plan for a better 205 Live. And you are not listening to the rules. Let me explain to you what you might understand. You already know what Proposal #3 is, but what you don't know is you are also in violation of Proposal #7 and I have not had the opportunity to inform everyone of what Proposal #7 was. So allow me to take this important moment in time and continue on with my PowerPoint Presentation! Pay attention, you might learn something this time. Proposal #7, say it with me now everybody nice and slow so that our friend here con understand: No Celebrating. That's right. Stop me if you've heard this before, but I have a dream, a dream of a true-topia. A place where talented ground-based athletes can compete in peace, shake hands before and after every match, and have to deal with a bunch of mindless celebrating. Because like celebrating Tozawa, just like your 'AH' chants, it turns the WWE Universe into mindless sheep. You might as well be chanting 'BAA'!" Tozawa has heard enough and roundhouse kicks him in the head, then does his own chant again. Enzo hobbles backstage talking to his championship about the "You deserve it" chants earlier. Ariya Daivari stops him and apologizes for what happened last night. Enzo doesn't accept it, but Daivari claims he was swayed by the cruiserweight mob. He congratulates Enzo on beating Neville on Sunday and calls him amazing. Enzo doesn't buy it and says, "Do I look like a piece of toast? Quit trying to butter me up bro." Daivari throws Neville under the bus for being the mastermind of the cruiserweight division attacking him, boasts his ego, then says he wants to be Enzo's friend and watch his back. He invites Enzo to watch his match with Neville tonight, Enzo takes him up on his offer and tells him he will be in his croner at ringside, then they shake on it. Daivari: "How you doin'?" Enzo: "Never say that again, ever. Aight, I'ma see you out there bro, you get him." TJP comes out for a match and we get a clip from 205 Live last week of him attacking Swann on the stage. In pre-match comments, TJP says since they were friends they couldn't have another match, so he ended the friendship with Swann. As Lince Dorado heads to the ring, Rich Swann rushes past him and THE BRAWL IS ON between Swann and TJP! They duke it out until TJP ducks out the ring and cuts through the crowd to get away from his "friend" while Swann wants him back in the ring. We get another clip of 205 Live last week where Cedric Alexander defeated Brian Kendrick, and post-match he was beat down by Jack Gallagher. Next week, it will be Alexander vs. Gallagher! Jack Gallagher and Brian Kendrick are standing backstage. Kendrick: "Questions, questions. Questions why would two guys who've been trying to tear each other apart are now standing shoulder-to-shoulder. Why would Jack Gallagher and The Brian Kendrick now be forming what seems to be some type of alliance? We could tell you, or we could show you, the same way we've been showing Cedric Alexander these last two weeks." Gallagher: "Exactly, Mr. Kendrick. You see, we're here to teach you poor unfortunate people. After all, actions speak louder than words. And what action speaks louder than cruelty? Cruelty is a gift humanity has given itself. It's like the coming of summer after those cold snowy months. The seasons must change, leaves must fall lke the weak. So Cedric Alexander, enjoy your sunny days, because next week begins the autumn of your life and a cruel winter on 205 Live." A commercial airs for WWE Hell in a Cell in under two weeks. Neville comes out for the main event and some fans chant his name. Neville: "I have heard what everybody are saying that yesterday I acted irrationally, that I am descending into madness. Well please allow me an opportunity to explain myself. Last night, I knew exactly what I was doing, and it was the best night of my life! Now I am aware that I sacrificed my Cruiserweight Championship rematch by defying the no-contact clause on Enzo Amore as established by Kurt Angle. But you know what? I don't care. And given the opportunity, I will do it again, and again, and again! So my advice to little Muscles Marinara, keep one eye open buddy because you never know where this creature is going to be lurking eager to feed off your pain and misery, because I refuse to allow 205 Live to degenerate at the hands of such a talentless little rat." Enzo Amore hobbles to the ring again using a crutch, still mocking Neville, but this time he has Daivari here with him for his match. Neville quickly ducks out the ring to confront Enzo, but Daivari attacks him from behind and throws him into the barricades over and over. Daivari points to Enzo saying that was for him, throws Neville back into the ring, gets a 1-count, delivers a backbreaker, picks him up by the hair and hits another backbreaker for a 1-count. Enzo is STILL talking trash and taunts Neville from ringside. Daivari hits a third backbreaker, picks him up, gives him a couple hiptosses into the turnbuckles and Enzo continues his trash-talk. Daivari stomps on him, sets him up on the top, Neville hits back elbows, Daivari pulls him by the hair to put him in the tree of woe, stomps on him, hits a draping reverse DDT from the corner, makes the cover but his feet were under the ropes. Neville comes back with a forearm, Daivari hits a jumping knee, discus forearm, covers and gets a 2-count. Daivari gets on the top rope but Neville rolls away from the frog splash. Neville back kicks him, front kick, back kick, basement dropkick, stomps him down in a corner, stares down Enzo, exits the ring again to confront the new champ, but Daivari hits a baseball slide. Neville ducks the hammerlock lariat, does an arm wringer, locks in the Rings of Saturn and Daivari taps! WINNER: NEVILLE. Enzo immediately whacks Neville in the back with his crutch and hits him with it repeatedly. Another referee comes down as Enzo does some ground-n-pound and shouts in his face. Finally Enzo has done enough damage and mocks the crowd chanting "You deserve it" towards Neville's beatdown.